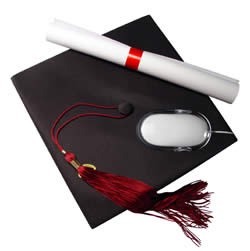 This section is geared towards distance learning students who are taking science and mathematics classes over the Internet and could use additional or supplemental resources to help with their online studies. A search on the World Wide Web can be daunting with the sheer number of links to sources of information; and, more often than not, considerable time is used searching and clicking, oftentimes with the result of not finding what you're looking for. Here you will find links to some of the best resources on science and mathematics that I have found over many years of teaching and using the Internet.